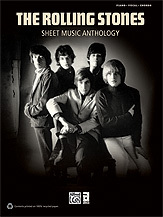 The Rolling Stones Sheet Music Anthology contains 27 piano/vocal/chord arrangements of the legendary British group's greatest hits. Many of the band's most memorable melodies are included, such as "She's a Rainbow," "Lady Jane," and "Ruby Tuesday." Titles: As Tears Go By * Dandelion * Gimme Shelter * Heart of Stone * I'm Free * Honky Tonk Women * It's All Over Now * The Last Time * Let's Spend the Night Together * Let It Bleed * Monkey Man * Mother's Little Helper * 19th Nervous Breakdown * Out of Time * No Expectations * Play with Fire * Paint It, Black * (I Can't Get No) Satisfaction * Sympathy for the Devil * She Smiled Sweetly * 2000 Light Years from Home * Under My Thumb * Wild Horses * You Can't Always Get What You Want.